Electric Pallet Jack Certification, Get Electric Pallet Jack Training! Pallet jacks, also known as pallet trucks, pallet pumps, pump trucks and jiggers, are used to lift and move pallets, which are flat transport structures used to support goods and most often made of wood. Pallet jacks are safer than moving pallets by hand, and are cheaper and more efficient than using larger forklifts. However, they still require special training for workers to keep the workplace safe. Learn how to prevent accidents when working with or near pallet jacks with our information on electric pallet jack training requirements below. Here’s something you might not know about pallet jacks and power pallet jacks: they’re considered powered industrial trucks by OSHA, which means they’re basically the same type of vehicle as a forklift. Sure, they don’t operate like a forklift. And they don’t look like most lifts. Yet pallet jacks still require all the training that forklift operators go through. This includes instruction and OSHA compliant instruction for all types of pallet jacks. If your employees don’t have up to date power pallet jack training, CertifyMe.net is the solution you’ve been looking for. From affordable classes to lifetime support, we’re one of the most popular and widely-used training partners in the United States. CertifyMe.net teaches workers about motorized pallet jack training, including class 2 electric motor narrow aisle trucks, and class 3 electric motor hand or hand/rider trucks. Ride on pallet truck, motorized pallet truck, and power pallet truck are other names used to describe a class 2 or class 3 electric pallet truck. Hand pallet truck training describes class 3 pallet trucks which require manual force, making them suitable for short-distance traveling and lighter loads. ▪ Class 2 pallet jacks include high lift straddle jacks, order pickers, reach type outriggers, side loaders, turret trucks, swing mast and convertible turret/stock pickers, low lift pallet jacks, and rider trucks. This class of pallet jack is made for its reach capabilities, being able to access the top shelf in a warehouse. The slim design allows them to navigate warehouse aisles easily and safely. Weight capabilities range from 3,000 to 5,000 pounds. ▪ Class 3 pallet jacks include low lift platforms, low lift walkie pallet jacks, high lift counterbalanced, and low lift walkie/ricer pallet jacks. This type of electric pallet jack, otherwise known as a walkie, isn’t designed with a mast and uses pallet forks or a platform to lift and carry loads only inches off the ground. Class 3 motorized power pallet jacks with masts are either counterbalanced or use outriggers or straddle arms. Weight capabilities range from 2,000 to 8,000 pounds. CertifyMe.net has electric pallet jack training and electric pallet jack certification (part of our Class 3 instruction) to help anyone become OSHA compliant – for less money that you thought possible! Pallet jack training requirements include teaching workers about the different types of pallet trucks, how to use them properly, and the specific types of tasks they are meant for. Called by many different names like power jacks, pump trucks, pallet pumps and power trucks, pallet jacks come in two main types: hand-powered and electric. Both types come with different pallet jack training requirements that address the different power capabilities and safety practices workers need to know use them properly and prevent accidents. Need to know how to use a pallet jack? Contact CertifyMe.net today! Let’s look at the difference between electric pallet jack training and hand pallet jack training. Electric power truck training, also called motorized pallet jack training, teaches how to operate a pallet jack that is powered by an electric motor. Electric pallet trucks can lift heavier loads and travel longer distances than manual pallet pumps. There are multiple types of electric pallet jacks that motorized pallet jack training teaches, including: walkies, end-controlled and center-controlled riders, walkie stackers, and reach pallet trucks. Optimized for various tasks and workplace settings, these different types of electric pallet trucks can make workplace practices easier, faster, and more productive. But, only if workers have completed their power jack training, or power pallet training. If you need electric pallet jack training, CertifyMe.net has everything you’re looking for. Our courses will get you on track for your electric pallet jack certification in no time at all! Hand pallet truck training teaches workers how to use a hand pallet truck, safely. The hand pallet pump is the most basic form of a forklift and uses a hydraulic pump fueled by man power to lift and carry pallets short distances. Although manual pallet jacks are made for quick material handling jobs, hand pallet truck training is still necessary for workers to avoid hazards that can lead to accidents. Hand pallet trucks can withstand the weight of several pallet stacks and, if not handled carefully, can come into contact with other workers nearby and crush them, causing serious injuries and deaths. Whether a hand pallet or electric pallet jack, if pallet trucks are used in your workplace, you need to look into top quality pallet jack training to prevent accidents while boosting productivity. Unlike manual pallet jacks, electric pallet jacks (also called power pallet jacks) weight a few thousand pounds without a load and rider pallet jacks in particular need to be driven very carefully because of the awkward way the operator rides the machine. The user stands on the side while the pallet jack moves and they are exposed on the end of the machine. Hitting an object or moving too fast can result in being crushed. Other common safety hazards include collisions, defective machinery, being hit by falling objects, and breathing in fumes from a charging battery. Pallet jack training requirements are met once workers fully understand the hazards associated with pallet trucks and how to recognize and avoid them. Know the pallet jack’s maximum lifting capacity to ensure you don’t overweigh it. Review the manufacturer’s instructions and operator manual. Perform an equipment inspection to make sure there are no broken, missing, or worn parts. Get to know the electric pallet jack safety features. Make sure your hands and feet are clean and dry, and that you aren’t wearing any loose clothing that could get caught on something. Unplug the electric battery charger and stow the charging cord properly. Make sure the forks are in the lowest position. Grasp the controller handle firmly. Twist the controller to move the pallet jack forward, and twist it in the opposite direction to move the jack backwards. Steer towards the pallet jack you want to move. Raise the pallet off the ground slowly, just high enough to clear it from the ground and stabilize it. Transport the pallet to the desired location. Lower the pallet to the ground and retract the forks while reversing the forklift. Plug the pallet jack back into the battery charger when not in use. Since the user stands on the side while the pallet jack moves, they are exposed on the end of the machine. Hitting an object or moving too fast can result in being crushed. Other common safety hazards include collisions, defective machinery, being hit by falling objects, and breathing in fumes from a charging battery. Pallet jacks can be dangerous just like any other type of forklift and they come with their own unique hazards. Pallet jack training requirements are met once workers fully understand the hazards associated with pallet trucks and how to recognize and avoid them. Electric pallet jack certification teaches workers how to operate the pallet jack safely and properly, recognize and avoid hazards, and maintain the machine properly. OSHA requires than all pallet jack operators have training credentials to operate this type of powered industrial truck. Whether you run a power pallet jack or electric pallet jack, CertifyMe.net has the training and coursework to help you become the safest, most efficient pallet jack operator anywhere! If you’d like to learn how to use a pallet jack, CertifyMe.net will show you how! Not only that, but you’ll be up to speed on all the latest OSHA rules and regulations. 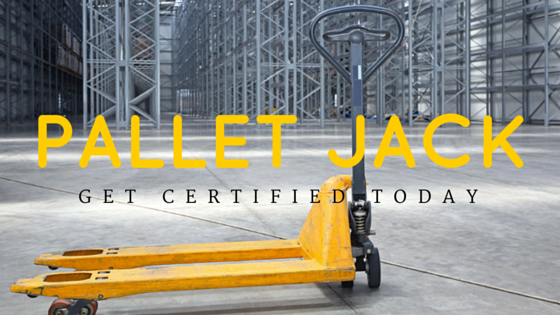 From electric pallet jack training to a valid electric pallet jack certification (you can print it as soon as you’re done with training), we have you covered! CertifyMe.net offers online motorized pallet jack training and hand pallet truck training that takes only about one hour to complete, can be accessed on any device with the internet, and each equipment class costs only $59.95. Workers have the option to take either English or Spanish instructions, and can print their certificate immediately after completing the course. CertifyMe.net takes OSHA standards and regulations very seriously and ensures all training programs are compliant by meeting absolutely all pallet jack training requirements. Whether you need to learn how to use a pallet jack or want to get your electric pallet jack certification, we can help. Give us a call today at 1-888-699-4800 to learn more. Or, click here for complete pricing information. Thanks for considering CertifyMe.net for your powered industrial truck and electric pallet jack training needs!